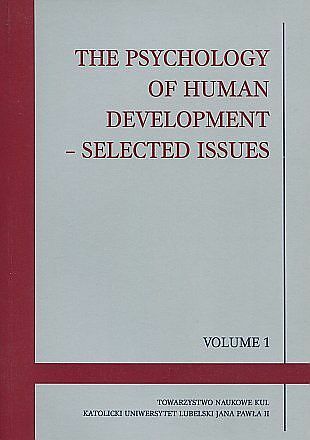 THE PSYCHOLOGY OF HUMAN DEVELOPMENT – SELECTED ISSUES presents a theoretical and empirical research on issues of human development, especially the problems of adolescence and adulthood. The present volume is taken on the basic issues of human development, such as: decision making, thinking, reference to value, or entering the world of adulthood. Such an approach development issues allows for the thorough analysis. Theoretical issues are devoted to issues of decision-making, functioning of the mind, emotions and significance of prayer in the human development and intergenerational interactions in the family. Empirical articles relate to the psychic development of youth and adults. Efforts are issues concerning adolescents for: the values in connection with world-outlook and beliefs in the context of development processes, shyness in social functioning, the relationship between temperament traits and anxiety as a feature and the magical beliefs of young adolescents. Research into adulthood are dedicated to finding a connection between the generativity level and the level mental welfare of women in the early and middle adulthood and relationship between certain personality traits and religious orientation and perception of religious jokes for adults. This publication is a valuable resource for academics and students and people interested in psychic life of human.